Stop and smell the … dandelions? Forget roses, forget lilies, forget sunflowers and buttercups, I love dandelions. Always have. As a kid I’d run through fields of dandelions, taking in their bright yellow sunshine hue, and that pungent spring scent, and the second I saw the ones in their last days, I was the first to multiply them with a quick blow (and a wish) of their diminished petals. 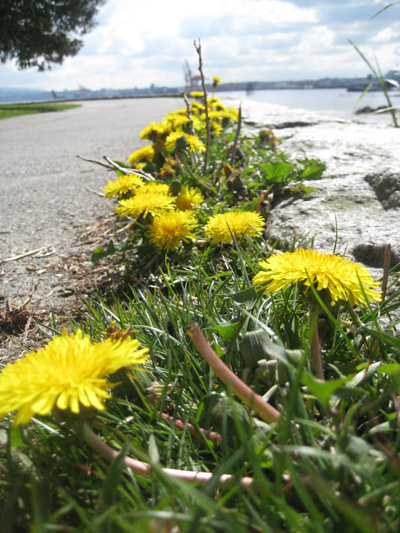 I am one of those people who, if I had a lawn, the bylaw officers would be pounding my door down, because there is no way I’d be mowing it – it would be a field of beautiful, contagious dandelions. Heck, mine and Mario’s first dance at our wedding was to Dandelion by Audioslave. Love them! And recently, with the prevalence of spring upon us, I’ve been reminded of another greatness that is the dandelion. Its scent doesn’t make me want to hurl while running! It’s true, I have a rather sensitive nose with heightened activity. It’s not just cigarettes that have me plugging my nose for cleaner air, perfume, pine needles, barbecued burgers, roses, wood mills, exhaust are all on the no-scent zone. But not dandelions! So last night at Pilates, I noticed that my left leg looked a little shorter than the right, and I started freaking out. I have a long history of that leg getting jammed up, and with the Toronto half marathon a week and a half away, and me not seeing my physio for another week, I think I had every right to freak out. I did not like the prospect of running two hours with that sucker flared up the entire time. And on top of that my shoulder has been giving me major issues, no idea what I did to it. So, I did what any girl in her right mind would do. I posted a rant about how I’m falling apart on Facebook. Turns out, it was the right thing to do. My favourite speed skating Olympian suggested I look into Active Release Therapy. Being the desperate case that I was, I called around until I found a place that could fit me in this afternoon. Have you ever had active release therapy? What did you think? This entry was posted in Running, Training and tagged active release therapy, injury. Bookmark the permalink. I think thats what eddy does to me, when he kneads my muscles. Man it hurts, but works. As for scents while exercising, i have to avoid running by english boxwood bushes. I curse the people who line their yards with those things! And music for my soul? Van Morrison. It’s like he reaches in and massages my heart. My parents were big fans and so now, its just something that completely soothes me. You are in for a treat when you have a preschool age child. They love to pick and give the dandelions, and lots of them!! Although the other day, R ran ahead of me and picked me a tulip right out of someone’s garden. He was so proud and had a smile from ear to ear so I didn’t have the heart to tell him he shouldn’t do that !